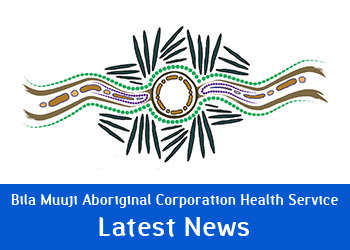 Aboriginal Corporation Health Services Inc.
Bila Muuji and its membership proudly donated a pallet of water to the Walgett Water Crisis. Three Rivers UDRH Rural Health Education (RHE) team, welcome and networking event, to be held in..
Building Strong Minds Aboriginal Mental Health First Aid Training Yoorana Gunya Worksh..
Christmas is coming and WAMS is having their Christmas Stocking plus 6 Gift Vouchers on display ..
Bila Muuji Aboriginal Corporation Health Service Inc.
© Bila Muuji Aboriginal Corporation Health Service Inc. 2011 - 2019. All Rights Reserved. This page contains 3rd party content and may contain images of persons now deceased. The above organisation takes no responsibility for any information contained on this page. The content, accuracy and opinions expressed are not necessarily checked, monitored or endorsed by the above mentioned organisation. Any links to a third party websites does not indicate any endorsement of that website, its content or any associated organizations. If you wish to express a concern or complaint, please use the contact form and we will contact the responsible content creator of the Information above.